The display and control function of the Samsung Side-by-Side model RS263TDBP has suddenly stopped functioning, possibly because of a power flicker that lasted less than two seconds. We live in an area where power outs are frequent, but usually, when something is affected, even for a second or two, other things like microwave clocks and bedside clocks also show the effects, usually by reverting to 00.00. The most recent event a week or so ago affected only the Samsung, which has not shown a normal display since then. It shows 2 blinking bars for the refrigerator, will not respond to any button I push, but is maintaining proper temperature in both the fridge and freezer compartments. The in-line surge protector does not indicate that it has been overwhelmed. I have disconnected from the power and let the system sit for more than five minutes, as suggested in the owner's manual, but it has not fixed itself. This is the second episode like this, the first being a few months ago and leaving it unpowered for 5 minutes or more eventually must have done something, because after a few days on not working, it fixed itself. Has the display computer just quit? Is it replaceable? Is it worth it? The unit will be 5 years old in July. Too new to die. If you gotta problem with me, just say it! May be error code. Which 2 bars are flashing. Still looking for an answer to what is wrong and how to fix it. Is there a control panel in the freezer door (where the display is)? Can I access it? Should I? Should I just leave it, since the settings seem to be right, and we only use the ice dispenser, not the water dispenser. Bars 3 and 5 are flashing. What does that mean? Where can I find out? The last time I talked to SamSung about this appliance (shortly after it was installed 4+ years ago, I was told they had no service representative in my area. The refrigerator fan may be blocked by ice, not getting voltage, or bad. You'll need to troubleshoot it to figure out which it is. All the fans and the compressor should be running. Both flashing bars are on the same side - right side - the fridge side. Temperatures in both sides remain as previously set before the flashing started -- about 10 days ago -- so things must be working, just a display problem? Thanks for taking the time to work on this with me. I agree it's an error code. Fix the problem and reset the fridge. I would start with the defrost sensor(evaporator sensor). Which is much cheaper than a display. I've had many technicians order displays because if the segments not even realizing it's an error code. It would be different if you had the normal bars or numbers with a segment or 2 missing, but you have the complete opposite going on. And yes I did come across one where it showed a defrost sensor error and was running fine. When I went to change the sensor the wire literally popped right off the sensor as I removed it. Samsung states that failed sensors can cause all sorts of errors. Thank you to all who have replied. 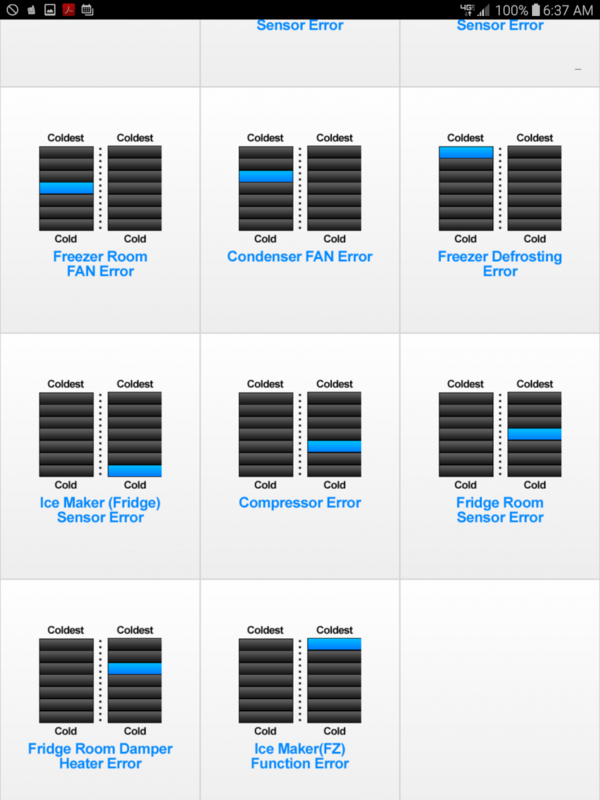 I finally have what may be the answer: error bar 3 = compressor error and error bar 5 = fridge room damper error. The responses also indicate that I'm over my head. Next stop: someone who can make a house call. How did they fix the compressor error?